With NBA season in full swing, you’ve been inspired. You are struck with a sudden burst of energy as you envision yourself on the court dribbling around obstacles and scoring that three-pointer your favorite team so unjustly missed the night before. You’re going to be the one parading up the court with confidence at your next game and you know it—you just need a little practice. However; there’s never room at the local court for you to focus on yourself. Then you look out at your barely-used yard and it dawns on you, why not put a home basketball court there? Fortunately for you, this interest in getting your own home basketball court can become a reality before you know it. This process simply takes knowing the right people and setting aside time to design the court to fit your every need. You’ve already stumbled across Sport Court, so you’re halfway there. Your very own Certified Court Builder will help you through the design process and the countless decisions you need to make as you create your personal court. 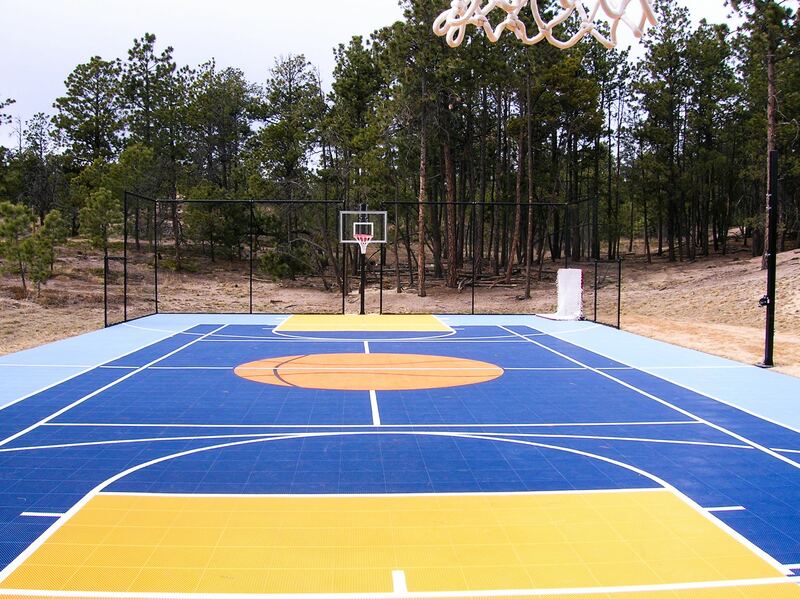 With various customization options, your court will reflect your own personality and design preferences. Once you begin the process you’ll be exposed to so many customization options that you may begin to wonder how else you can utilize a Sport Court home court. The first major decision you must make is whether you would like your court to be a basketball-focused court or multi-sport game court. Multi-sport courts are most popular with families so their children can play whichever sport peeks their interest. Building a space where you and your family can play and practice any game at any time will bring the family together and give your children the opportunity to be MVP’s of their own. That said, there is something to be said about the clean-cut lines of a court dedicated to your favorite sport. Are you a committed basketball fan? Are you a basketball star in the making? In that case, Sport Court is happy to create your very own basketball court to cater to your dedication to the sport. Once the decision between a multi-sport or basketball-oriented court is made, it’s on to the fun part. When you’ve picked where the court will go, it’s time to choose your color scheme. Whether you decorate your court with your favorite teams’ colors, an ode to your alma mater, a matching color scheme to your home, or a simplistic look—Sport Court has the style for you. With the help of the Sport Court Court Builder, you can choose from a library of options to create a court that is unique to you. You’ve already decided on a court, now is the time to choose and bells and whistles! This part of the decision means you’re deciding on what kinds of lighting, fencing, rebound nets and hoops you want for your court. These various personalization options will allow you to build the court in the hang out spot of your dreams. Getting a Sport Court home basketball court is probably the best decision you’ll make this year. It’s an addition to your home and a promise to stay in shape all year long. With the help of our team, you’ll get a court that matches your personality and style exactly, all while giving yourself and your family a gift that lasts a lifetime.